I am finally getting around to sharing fireplace makeover before and after photos. There were so many questions when I was posting about this on my Instagram stories that I hope to cover everything but if I miss something drop a comment at the end of the post. We had our fireplace refaced in October. It was 2 years in the making. I had tried several times to update it with very low cost fixes on my own but I was never satisfied with the results. Specifically I really disliked the tile hearth in front of the fireplace as well as the glass surround (once brass, then painted black). As I just mentioned, one of the quick fixes that held me over for awhile was painting the brassy fireplace doors to a matte black. This was an improvement, but it still didn’t look clean and cozy to me. I wanted a white fireplace and when I searched Pinterest I was leaning towards a cleaner wood surround instead of brick. Some people are very partial to brick and don’t even like when people paint fireplace surrounds. Ours was painted white by the previous home owners and I liked it, but it wasn’t exactly what I wanted. This is what the fireplace looked like when we did a walk through of the house before buying it. I love Pinterest. I get the majority of my home ideas on there and some from home bloggers I follow on Instagram. Below you can see one of the photos I shared with my contractors to give them my vision. This is one of the two photos I pulled from Pinterest for the contractors. I opted to leave the fireplace open. We have a gas fireplace so we mostly use it when the kids are in bed. We don’t turn it on if kids come over, etc. In the future we can add a free standing fireplace screen if we chose. The fireplace during refacing – after removing the glass doors. 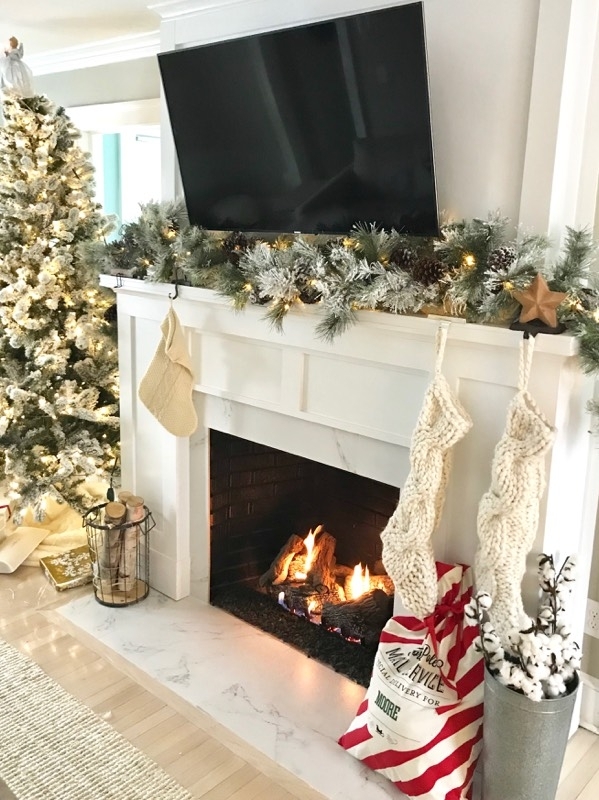 Originally I did not want to mount the TV above the fireplace because I wanted to decorate the mantle for each season. Well, real life, I’m lazier than my hopes and vision so I wasn’t getting around to it. We have a narrow living room and my husband insisted on a HUGE lounger sofa so space is an issue. Ultimately I decided I didn’t want to waste space on a TV stand. I looked for TV stands for years and never found one I liked. Ultimately I submitted to my husband’s wishes to mount the TV over the fireplace. The TV is wired through the wall so that the wires are not showing. We had the contractors do all this because it required running some wires through the basement. We don’t have cable so we had to run wires through the basement to an antenna that sits at a window. Side note – there’s a backstory to the cable thing. I don’t watch TV and I thought my kids would watch less screens if I ditched the cable (an enormous cable bill). Instead they watch shows on Amazon Prime and the iPad. I purchased porcelain tile that looks like marble, but is much more durable. Marble is very soft and scratches and stains easily (as I’ve learned from my kitchen). The tile cost about $300 but I had to purchase $440 worth of tile because of the way it was packaged (four 20″x20″ tiles to a box) . I’m sure you could find places that sell individual tiles, but I didn’t shop around much. This is when the tile was being replaced which was one of the things that I disliked the most from the BEFORE photos. I showed the contractors the pictures of what I was going for and they came up with all the measurements and figured out how to create a cohesive look with our current moldings (our house was built in the 1920’s) etc. The contractors I hired happen to be old friends of mine so not only did I trust them but I’d seen lots of their prior work and knew they had artistic vision. When you’re creating a project like this there are LOTS of unexpected small decisions. Finding someone who understands current design trends (and what is a fading trend) is helpful. You can see in the next photo we were also getting our floors refinished during this process. I peaked in to see the progress when our floors were being redone. How much did the fireplace makeover cost? Including the tile, the total cost of the makeover was around $3,400. That is with installation of the TV/mount. We have a fairly small home so it’s really the focal point when you walk in the house. I’m so happy with how it turned out. Fireplace Makeover Before and AFTER !!!!! My living room paint color is Revere Pewter by Benjamin Moore which was wildly popular a few years ago. It’s a bit dark for my tastes these days but not dark enough that I’ve taken out a paint brush :). I’m working on window treatments in my downstairs at the moment. Did you like the fireplace makeover before and after? I love your input as to what types of content you like! I wanted to add more home content in 2017 but ended up I sharing it mostly on Instagram stories and very little here on the blog. If you like home and DIY content you might like this easy coffee table makeover I did. Let me know either way in the comments below because I’d love your input planning content for the New Year! I’m so appreciative of you stopping by. 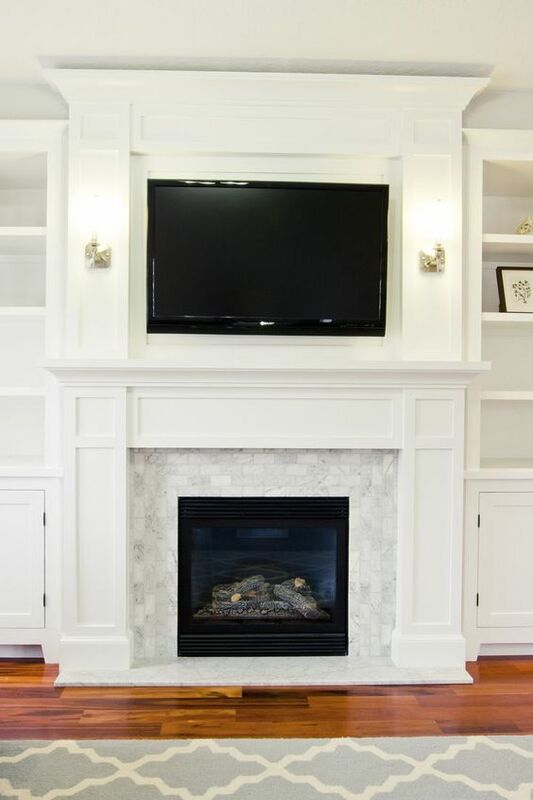 Your fireplace makeover is gorgeous! I’m looking to do something similar and will definitely be pinning your pics. I’d love to see pictures when you’re done. I love the home content. I have been struggling with wanting a fireplace maker for several years so this is helpful. Thank you for sharing the details. Looks great! Our fireplace is almost identical to yours and this is exactly what we would like to do with our fireplace. Thanks for sharing including your cost. This is a good reference when we start to get price quote for contractors..
I’d love to see pictures if you go through with it. Loved this make over! Very real process and I love how honest you were about cost! OH BOY!!! HAHAHAHA. That was quite the “vacation”. Happy yo be home but she sure did keep me laughing. What a beautiful makeover! I can definitely say your fireplace looks so much more beautiful after. It didn’t look terrible before but man the after results are just gorgeous! Awe I have been looking forward to seeing this! Looks amazing!! Thank you so much Lydia! I appreciate the kind words. Thank you so much Alina!! !